This is a great waterfall. Not only is it photogenic, but it also has impressive volume (the Cutler River), a great setting in the White Mountain National Forest, and an easy hike from the parking area. The first time my wife and I visited in 2005 we missed the waterfall. I was really bummed when I got back home and found a picture of it. Fortunately for me we were driving through the area in August of 2006 on our way back to Boston and I talked my lovely wife into stopping again. Really, don't miss this one if you're in the area. 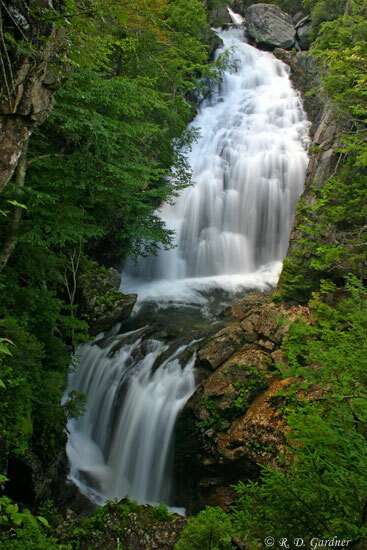 There is also another great waterfall nearby - Glen Ellis Falls - with an even easier hike of just a few hundred feet and several steps to the base. 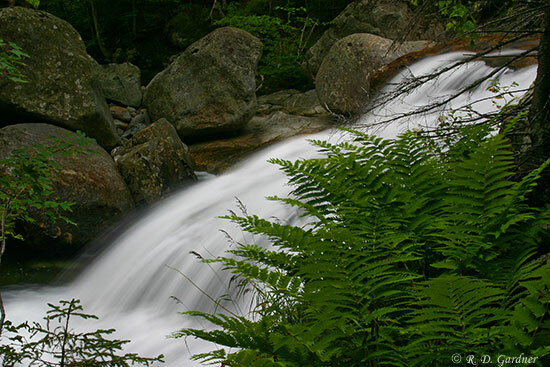 The trailhead for Crystal Cascade is directly behind the AMC Pinkham Notch Visitor Center parking lot. Great directions can be found on the Appalachian Mountain Club website. The trail for the cascade is well marked and well worn as you will be following the popular Tuckermans Ravine Trail. The trail is not steep but is a steady climb. When you come to a wooden bridge across the river, you are almost there. Follow the trail as it curves right. There is about 200 feet of steep and rocky trail up to the overlook and you're there. Total distance to the cascade is 0.3 miles one way. I read somewhere that the area is very crowded early morning from Tuckermans Ravine hikers so be aware of that. Again, this is a great slow shutter speed waterfall. Without a tripod you will be disappointed in the results. However, if you followed my advice and brought a good tripod you're in for a treat. Ok, just for the record - Yes, I screwed up on the ISO setting of the picture above. I should have checked my camera and set it to ISO 100. Alright, even brilliant people make mistakes. Working area is somewhat limited due to the rock wall of the overlook. I had to straddle the wall with the tripod legs for the best angle. 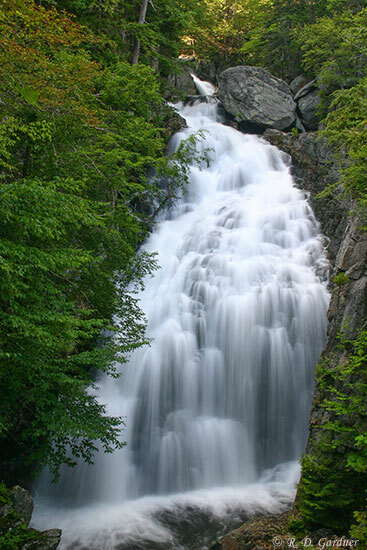 A normal-to-wide angle lens will be required to get the entire length of the waterfall. For best results you will need a polarizer to reduce glare on the water and foliage. Also pay close attention to composition and how much sunlight is hitting the water. There are no problems with bright skies or horizon issues but if the sun is out or if the clouds are thin you could have problems with overexposure on the water. Try bracketing some, about 1/2 to 1 stop underexposure or so. I was there late afternoon and had pretty good lighting conditions but morning would be best.